Didn’t the Orange car run the Tire Shop with Luigi in the movie ‘Cars’?. BTW, is that a 3 wheeler? It’d probably be fun to drive, like a zero-turn bumper car. There are no doors–the front of the car opens up (and the steering column disconnects from it) to seat you in the car. I also believe it has a small air cooled engine running it. It’s a favorite of the “Corvair Crowd”, but due to the expense of the ones currently available, (I’ve seen fully restored ones in Hemmings for 40K and up) , you don’t see too many in the streets. The originals had the 3rd wheel in the rear. Unlike GM (SSR–HHR), Ford (T-Bird) and Chrysler (Airflow–merely a reskinned POS Neon), BMW apparently KNOWS how to build a retro-car. 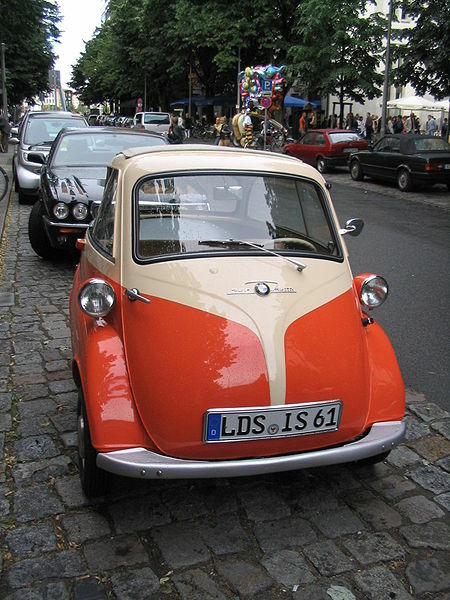 It was also the “Urkel” car… I have a Corgi model from the mid ’60’s of the Isetta. They also referred to it as the “bubble car”.